Being a mom comes with many unexpected days. Some mornings go perfectly smoothly. The kids finish breakfast in 10 minutes, no meltdowns, everyone is in happy sunshiny moods, and you’re on your way with your day. But then there are the days when everything goes wrong by 6am. If fitness is one of your priorities, then you need a backup plan when the gym just won’t happen. Moms have to be flexible, it just comes with the territory. And with the change in day, it’s also important that you still fulfill what’s important to you and makes your day “somewhat complete”. Is it possible to continue your workout routine in at home? Absolutely. This is a great way for you to pursue your fitness regimen or begin one if the gym is not an option. 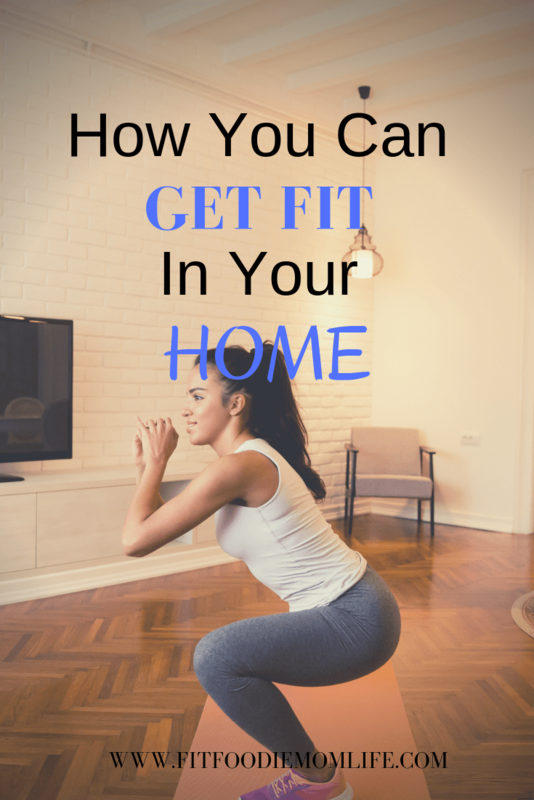 It is definitely possible to get in shape right inside your home and you don’t have to spend loads amount of money and time hauling kids around. All you need is a yoga mat. Of course there are benefits to joining a yoga class with a licensed yoga instructor. But you may not be in the season of life that allows you to join a class. That’s okay and perfectly understandable. There are plenty of yoga videos online and subscriptions you can sign up for to experience a daily variety. Kids are only little for a short period of time. You’ll have plenty of opportunities to head back to the gym once they’re back in school. Aerobics can easily be done in the comfort of your home as well. You can get a good sweat, burn calories, and release endorphins–something that can relax you as a mom. Of course you can always expand your equipment for an affordable price. Investing in basic fitness equipment will give you more variety and allows you to establish a good fitness routine within your home. Another positive aspect so you don’t have to commit to a gym. This one is my all time favorite! I enjoy the burn, the sore feeling afterwards, and the sweat rolling down my back or dripping off my face (yes, I enjoy sweat!). Weight lifting also helps with posture, core strength, and any possible back pain. It’s time to strengthen those muscles. A dumbbell rack can be the best investment for getting started. Or possibly a few kettlebells as you’re growing your in home gym. Kettlebells are space efficient and an effective pice of workout equipment. Of course listen to your body and start slow. Your body is strong and weight lifting can achieve many positive benefits. There are plenty of options online to find the best kettlebell weight for you so that you don’t risk injury. Squats are a highly popular exercise that are great for strengthening the core muscles, the legs and glutes. In fact there are plenty of squat challenges and variations available on Pinterest. Squats show results within a few weeks and they are a great addition to any workout regimen. You certainly don’t have to go to the gym to do a squat, but the main thing when doing squats is to make sure that you’re doing them correctly. The last thing you want is to injure yourself. Keep your upper body upright and your core engaged. Focus on your glutes and keep up a good pace to feel the burn. YouTube has great in depth instructions on how to perform a proper squat. A good cardio workout can be achieved through things like cross trainers and treadmills. You can find these online for very affordable prices. If you have the space for one then you could easily find yourself maintaining a very good routine from your home every day. Also grabbing the kids and going for a run outside is another perfect way to get fresh air, sunshine, and exercise. You see, just because you can’t afford a gym membership or it’s too much with the kids and managing life and all the things, there are plenty of options. Invest in a few weights, resistance bands, medicine balls, yoga mat, and whatever else you need to set up a basic in home gym! When my husband and I only had our son, we lived in a tiny 2 bedroom apartment. I worked out in my living room every single day. Basically I moved the sofa, coffee table, and had a few weights stacked away in the closet. It worked and after the 30 minutes were up, I felt ready to tackle the day and turn my focus back to motherhood duties. Invest a little bit into yourself.